Product Consists : Gem Blue Boi Care Olive Shampoo For Dry to Normal Hair (Weight : 500 ml), Free Breath Shower Gel (Weight : 295 ml),YC Transparent Cucumber Soap (Weight : 135 Gms) along with 2 Containers of non toxic herbal scented holi colors (Weight : 50 Gms Each). Enjoy the festival of Holi with lots of fun. May you be as colorful as the festival itself or even more for your receiver. A true and caring relation doesn't have to speak loud, a soft message with memorable gift is just enough to express the heartiest feelings. 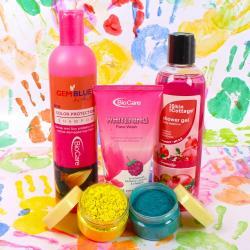 Here this Holi Health Care Gifts is specially arranged for Happy holi wishes . 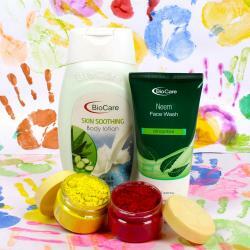 By using safe, Non Toxic natural colors we not only save your loved ones skin but also help save our environment. 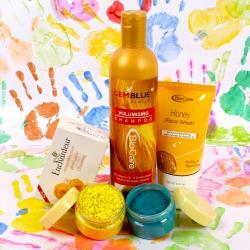 Use the skin care products which we have specially included in this hamper for holi festival. This combo is presented as gift to any one. 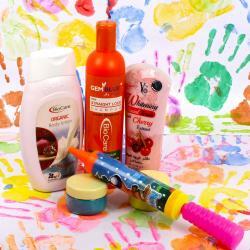 If you are looking for some exotic Holi Hampers for your dear ones, friends and family, then head to Giftacrossindia.com the largest variety gifting store of India. Browse your favorite products, it is very conveniently available for online shopping from anywhere in India with Free Shipping. 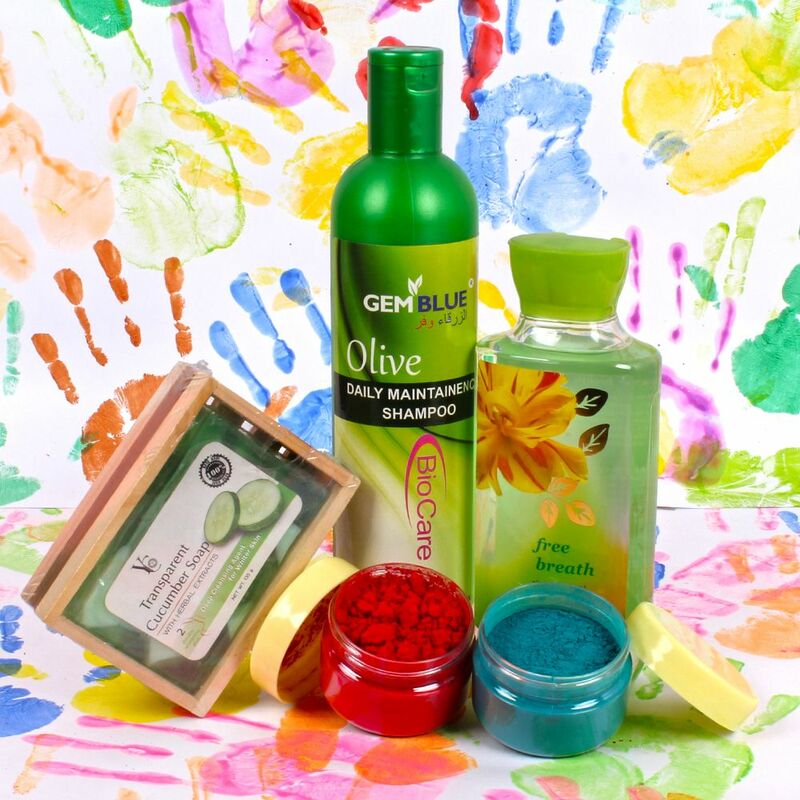 Product Includes : Gem Blue Boi Care Olive Shampoo For Dry to Normal Hair (Weight : 500 ml), Free Breath Shower Gel (Weight : 295 ml),YC Transparent Cucumber Soap (Weight : 135 Gms) along with 2 Containers of non toxic herbal scented holi colors (Weight : 50 Gms Each).